The LG V10 garnered a very positive response from our readers and it is indeed an excellent phone. It has two potential drawbacks – the Snapdragon 808 doesn’t have the best GPU for 3D gaming and the 3,000mAh battery is a bit too small for a phone of this size and weight. Indeed, the LG G2 – a noticeably smaller and lighter phone from 2013 – had a 3,000mAh battery and it didn’t have a huge, high-res 5.7" QHD display to feed. And then there's the second screen. 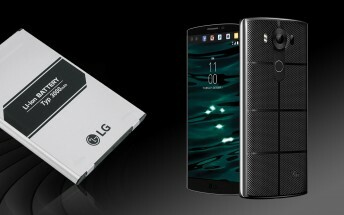 LG could have gone with AMOLED, but chose a more complicated engineering solution to keep the second screen always on in a power efficient way. We ran a standby test with the screen on and off and found that it leads to a 70% increase in standby power draw. Still, the impact on the endurance rating isn’t huge, it goes down from 56h when the second screen is off to 46 hours. You'll get around two days of moderate usage in either case. There's an option to enable the second screen only when the main display is on, if you want to stretch out the battery. The talk time of under 17 hours was a little disappointing. The LG G Flex2 lasted an hour longer and the Galaxy S6 edge+ almost doubled the result, both have the same 3,000mAh capacity. The web browsing time proved average, lasting around 8 and a half hours. The AMOLED-based G Flex2 lags significantly behind, but the S6 edge+ is ahead by a couple of hours (different AMOLED tech). Video was more disappointing at 7 and a half hours. The LG V10 finds itself among older devices that were not particularly optimized for video playback. This is an area that hasn’t been LG's strong suit, the G4 scored a bit less. Keep in mind that the brightness slider of the V10 is not very linear. You only get close to the 430nit max brightness very near the right end of the slider, at half (the position we used for testing) it's closer to a quarter of the max value. So to reach the numbers we did, you'll have to be conservative with the brightness.